We all know that we are surrounded by the great Northwoods, but how well do you know the different kinds of forests? In this week’s Wildlife Matters, the Masked Biologist delves into succession and the important role of the aspen forest. 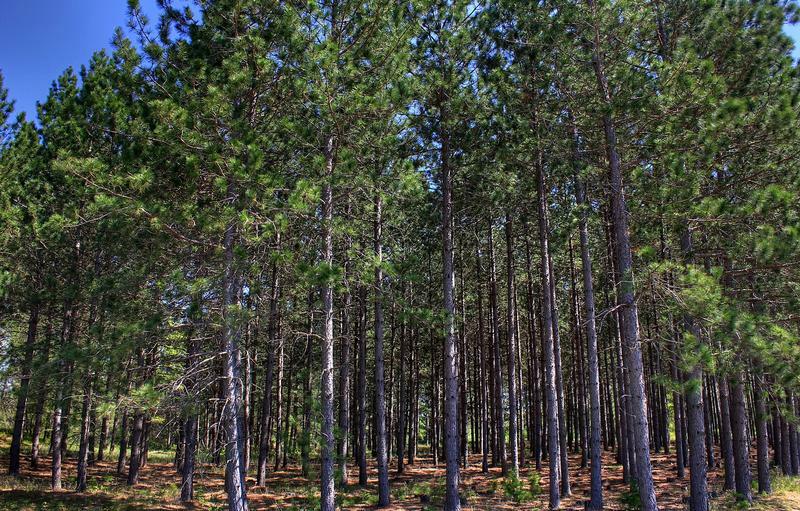 Wisconsin has a variety of forests, and each variety has an important role to play. Here in north central Wisconsin, we have a lot of pine forests, hardwoods, some oak forests, swamp conifers, and aspen forests along with a few other types. Aspen forests are an early successional habitat, which is favorable for many of our game species and nongame wildlife species that call Wisconsin home. Succession is the term we use to describe the changes in land cover over time in a given area. We start with an event that “sets back the clock” of succession, what we call a natural disturbance. A disturbance like a tornado, flood, or fire may set succession back one generation, taking out trees of all ages, leaving the ground ready to produce new trees. A major disturbance, like a glacier, sets succession back to a bare dirt (or even bare mineral soil) condition. After a glacier, only small, hearty plants that are well suited for pioneering and colonizing an area will succeed. Over time, they live and die, reproduce, add nutrients and organic matter to the soil and other plant species that take longer to travel by seed and need more accommodating soil will move in. Eventually, seeds of shrubs and small trees will travel into the area either by wind or by hitching a ride on a bird or animal, and we will have an early successional forest. The same thing happens on a smaller scale in old farm fields. Early succession trees grow rapidly, have a shorter life span, and may have more than one way of reproducing which is quite different from later succession tree species. Take the aspen tree for example. Aspen trees are dioecius, meaning there are male and female trees. Both trees flower in spring, but the male tree flowers produce pollen, where the females do not. When the pollen is carried from a male flower to a female flower, magic happens, and the female tree produces seeds that when planted grow into baby trees. The flowering parts of adult trees (called catkins) are a popular food for ruffed grouse, turkeys, and other birds. Aspen have a second way of reproducing, called suckering. The tree will send out roots that have the ability to produce additional trees that are genetically identical to the parent. This becomes an organism called an aspen clone, and the death or removal of an individual tree or even trees does not kill it. Disturbance of the parent tree increases the suckering activity; if the tree is killed, or cut, the root system survives and aggressively produces small trees anywhere within reach. These lush, green-leaved suckers are a great food source for deer and other wildlife. As they grow, they grow fast, tall, and thin, so crowded together that a person can’t easily walk through them. Birds love these stands because they provide a lot of food, and the heavy cover protects them from predation. You can almost think of aspen like the grass in a pasture, or your yard. The more you harvest, cut, or consume the part above the ground, the more the root system works to re-generate it. If you let your lawn get long enough, it eventually grows seed heads. When we want aspen to stop suckering, stop cloning itself and spreading into the open areas around them, we stop cutting them. If we let the aspen trees mature past 50, 60, maybe 70 years, they become old and decrepit, the condition of the organism above and below ground degrades enough that suckering is effectively ended, and the organism dies. So, when we see an aspen forest that has been harvested, we call it a young forest, but in fact it may be older underground than many old growth hardwood trees. Aspen might appear to wink out over the years as climax vegetation, what we used to call old growth, takes over the forest. However, it can persist underground for hundreds to thousands of years, waiting for a disturbance to reset the clock and trigger the pioneering stage of succession again.